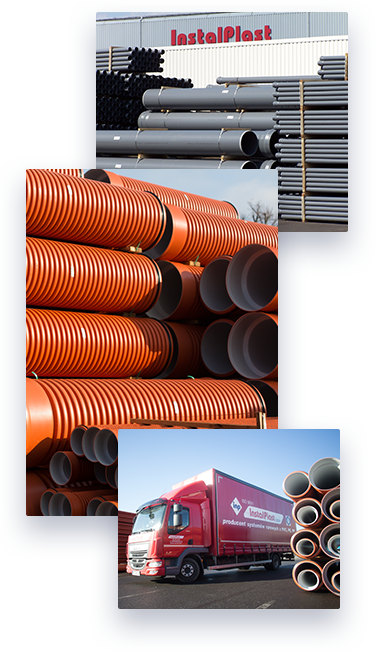 InstalPlast Łask is one of the leading plastic pipes private manufacturers in Poland. Established in 1991, the company is operating only on polish capital basis. Wide range of products includes pressure pipe systems, sewage systems and protective pipes. The company’s strategy of development assumes constant and dynamic growth of production and distribution . Thus, we focus on systematic expansion of the assortment, modernization of manufacturing machines, improving the quality of products and training of the work staff. The offer contains high-class products in the reasonable and appropriate prices. These atributes let us compete with the largest operators in the industry and gain appreciation of vast number of regular customers – installers and distributors – in Poland and abroad. Location in the centre of the country has a significant, positive impact on logistics operations. The company uses only the best available raw materials. The process of production is carried out using the newest technology and modern devices of such firms as: BATTENFELD, ENGEL, SICA, IPM, due to which we assure consistent high quality of products. In 2001 we have implemented and maintain Quality Management System ISO 9001:2000.